No idea if this is a common bug or not, but he was found crawling around on my kid (in hair). It is VERY small, maybe 1mm wide and 3 - 4mm long. It just looks black when looked at with the naked eye. I shot these under macro lens so he is enlarged, interesting to see the color is not actually black also. into the new Order Psocodea. Come on in and join the barklice! This is a louse, quite clearly. 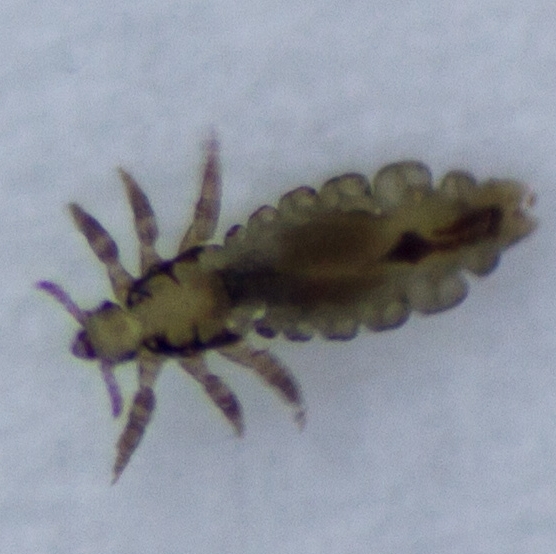 I'd suppose Pediculus humanus, the aptly named head louse. Nice! Guess that explains why it was in the hair.